Winters are so much better! The overcoats, the scarfs, the lovely cardigans and sipping hot chocolate. Moving on from the heat, m gonna be talking about my other love today, Chocolate. Chocolate is happiness. There's a quote I really like - "Chocolate doesn't ask questions, it understands" !!! Chocolate when eaten in moderation is good for your heart and is an excellent antioxidant. Chocolate is known to improve mood, relieve stress and is a great source of energy. So whenever you are feeling low, have some chocolate and it will instantly make you happy. I am a big fan of Chocolate so by default I Love Nutella too! Nutella is a hazelnut chocolate spread. 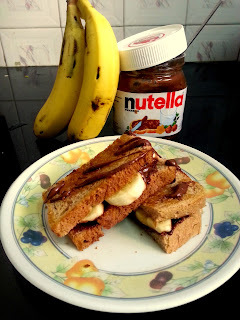 To all of you who haven't tried Nutella yet, you guys are missing something in life. It is so so difficult to withhold yourself when midnight hunger strikes and Nutella is just right there in your fridge. I almost can't fall asleep then!!! Sunday is a day to binge. We all get up late, starving and craving to have something which can be made quickly and is also soul satisfying, This sandwich just takes about 5 mins to make and is mine and my brother's top favourite breakfast. Your day has to go perfect if you have a sizzling sandwich crunchy on the outside and filled with gooey chocolate goodness in the inside!! When I dig into this sandwich, everything in life makes more sense and becomes more beautiful. The experience is really something! Apply butter on both slices of bread. 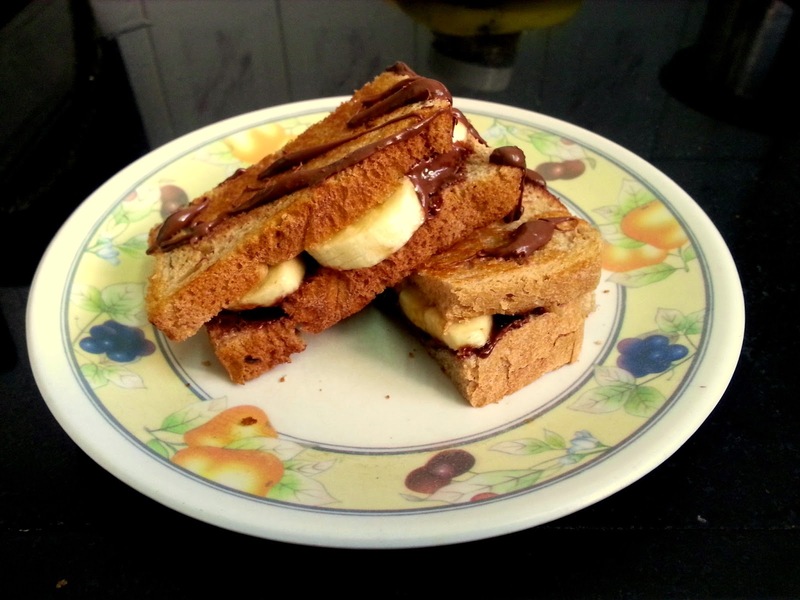 Spread a thick layer of Nutella on the other side of one of the slices of bread, top it with slices of banana and sprinkle little cinnamon powder. Now put together the sandwich by covering it with another slice of bread. Place the sandwich on a hot flat griddle (Tava) and cook till both sides are crispy. You can make the sandwich in a sandwich maker too. Cut into two halves and serve hot! Looking yummy .....vl try.....but is it healthy or faty??? N plz post some more recipe on nutella .